Hadoop Application Architectures by Grover, Malaska, Seidman, Shapira New..
New Directions, an innovative team-building and leadership development firm, launched their newest service focused on providing an intensive ‘boot camp-style’ course on organizational leadership. 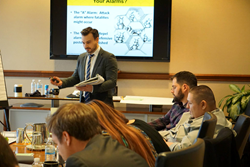 The course, a 2-day immersive workshop, uses the firm’s recently published book Survival of the Hive: 7 Leadership Lessons from a Beehive to create a fun, engaging and highly effective retreat for emerging leaders. Survival of the Hive, published by Authorhouse (2013), launches a new conversation about leadership for organizations of all types and sizes. In the post-recession workplace, organizations need a fresh way to build leaders to ensure their survival. Survival of the Hive uses one of the world’s most industrious and successful creatures, the honeybee, to guide leaders on how to build accountability, communicate more effectively, engage and motivate the workforce, and build loyalty and commitment. Harrington continued, “The Survival of the Hive approach to leadership is focused on using the beehive as an allegory to your organization. What would your new managers need to learn and be competent in for your organization to survive and thrive much like a buzzing and highly efficient beehive? We find that using a metaphor such as a beehive makes the leadership lessons easier to learn, apply and remember on the job. The Survival of the Hive Leadership Boot Camp focuses on creating the personal mission, vision and values of leaders; embracing the core leadership behaviors necessary for a transformative culture; understanding what it takes to build a collaborative, team-based work culture; teaching leaders how to establish accountability and delegation through motivation and prompts, learning what is necessary for highly effective leadership communication; teaching how to build a quality mindset to build the perfect product or service; and providing leaders with skills to train their workers to guard against internal and external threats.